Three cheers for Jack Shepherd for putting the Chartists, that amazing generation of 19th century British freedom fighters, on centre stage in the wonderful space of the Globe Theatre in his new play Holding Fire. And much praise for his effort to bring out the differences between the revolutionary and “moral force” wings of that movement, which between 1838 and 1848 explored every avenue of struggle available to working people, from petitions to armed uprising. The Chartists clarified the strategic battle lines between revolution and reform that have been debated (in theory and on the streets) in countries on every continent ever since. Muted applause for the play as a whole, however, which tries to do too much. Shepherd says the fuel for the play was not only Chartism, but his own sense of moral outrage at the way working people were treated, at the squalor of the lives of many and at the indifference of the middle class. In trying to portray all of this he has created something too diffuse to pack a real punch. The main focus is on Lizzie, a young woman from the most degraded background taken into service as a scullery maid, and on her lover, a fellow servant. This gives Shepherd the chance to explore the cultural pretensions of the new industrial bosses and their families, turning away from the sweat and misery of the factories on which their wealth is based; Methodism and its hypocrisy and support for the status quo; and the squalor and degradation brought about by widespread drunkenness. Shepherd says he was interested to write a play setting out the impact of violent social change on an epic scale “destroying the lives of ordinary people”. But the historical characters are given speeches in a ranting style that conveys an impression of a sect, rather than the first mass movement of workers in history, with millions engaged in a struggle where the future government of Britain hung in the balance. It also means we lose the power of the language of the period, as 21st century terms are used to describe 19th century problems. But there are some things that never change – a mealy-mouthed Home Secretary who agrees the Chartists have a case but “the time is not right”, whilst at the same time mobilising the spies and armed militias. The opposing wings are represented by William Lovett and Fergus O’Connor – a quiet self-educated English gentleman and a Celtic firebrand. But alas in the first half of the play the tension between them is not established as the plot sets all its many rabbits running at once. After the interval there is a moment when the play suddenly takes off. 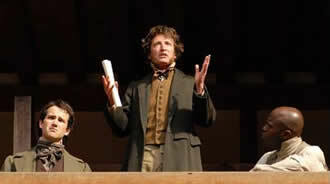 The audience are transformed into the 1839 Chartist Convention, and actors in different parts of the gallery put forward the conflicting views on the way forward for the movement. There is a new dramatic tension, a real struggle, at the heart of the play. It is the evening’s best moment and the best use of the space. The Convention finally adopted the motto "peaceably if we may, forcibly if we must", a reasonable summary of the conflicting views represented, but enough to frighten off many of Chartism’s middle-class supporters at that time. The six points of the Great Charter were votes for men over 21, a secret ballot, abolition of property qualifications for members of Parliament, pay for MPs so that not only the rich could stand for election, constituencies of equal size and annual parliaments. The last demand was said to present “the most effectual check to bribery and intimidation” because “members when elected for a year only would not be able to defy and betray their constituents as now”. The last point is the only one not yet achieved, and for good reason. When MPs enter Parliament today, they are co-opted into the state, that unelected superstructure of institutions, which exists not to carry out the will of the people but to maintain and manage the status quo. If it were otherwise, Britain could not have taken part in the invasion of Iraq on behalf of Bush and the global corporations, since the vast majority of the people were totally opposed. It is good to be reminded of the unfinished business left over from the Chartists’ struggle. The Globe under its new director Dominic Dromgoole is becoming so much more than a tourist attraction, with this current series of plays entitled “Renaissance and Revolution” representing an excellent new departure. And with ticket prices far below the West End, including 700 standing tickets at £5 each for every performance, it is an experience open to anyone.